Krunk – Page 3 – Krunk4Ever! Choose a destination with a supported architecture in order to run on this device. The target builds fine and I’ve made no changes since duplicating it. I made sure all the build settings are the same, including architectures and SDKs. I was baffled on what might be causing the error. 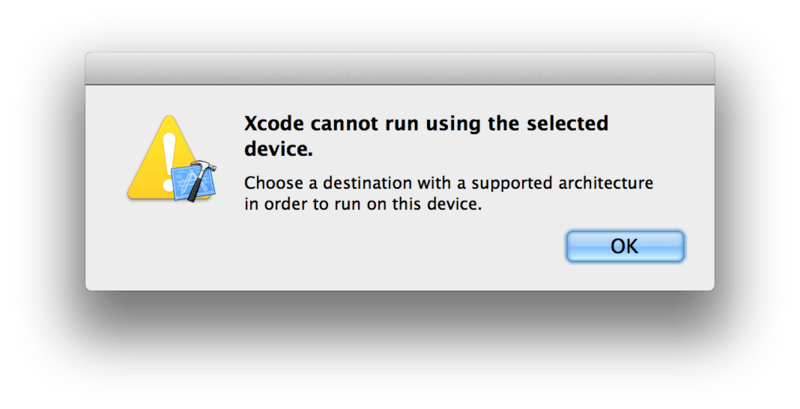 After searching a bit, I found this post on StackOverflow: Xcode 4.4 – Unable to run project. The answer is hidden in the response by Martin Lockett. The default product name Xcode gives to a duplicated target is “AppName copy”. Spaces are illegal in product names, so it was failing to run on any device because of that. After fixing the product name by removing the space, I was able run on both the simulator and device. I’m not sure if previous Xcode had this problem, why Xcode duplicates a project with a product name that makes it unrunnable, nor why Xcode doesn’t provide a better error message, but I’m glad I figured what was going on. Several of my colleagues and I noticed that after installing OSX 10.8 Mountain Lion and updating Xcode to 4.4, all of our application icons in Spotlight are showing up as Xcode C files. Anyone have any idea what’s going on or how to fix it? I just installed the MacBook Pro Retina SMC Update 1.0 and it looks like it has fixed my icons issue. You should be able to see the update when you run Software Updates. Is multiupload.nl blocking USA? Redirecting users to theinternetvshollywood.com? Just wondering if this is an US-only problem… similar to how certain file sharing sites are now blocking the US. Don’t see much mention of this on the web, but I did find this thread where someone else was hitting the same issue and he was able to bypass it using a proxy outside the US.